We’re probably all familiar with the story of “Fiddler on the Roof” – where Tevye, the Jewish milkman in a little Russian village at the beginning of the twentieth century, sings praises to tradition – the social glue, the thing that gave order and meaning to life in the family and the village. 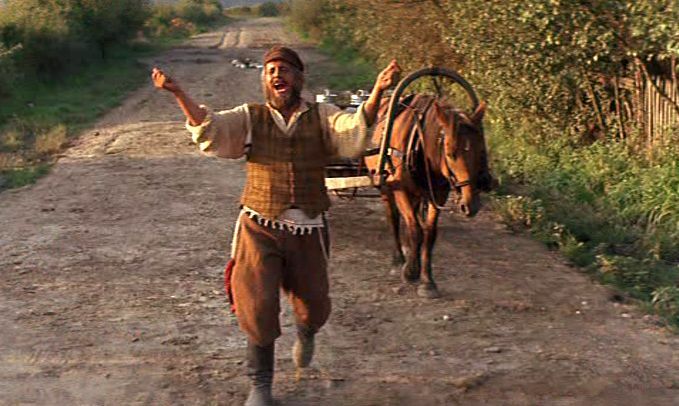 But Tevye is living in a time of great social upheaval that’s challenging a lot of those traditions, and he’s struggling to keep up. One of his daughters wants to break tradition and receive his permission and blessing to marry the man she wants, instead of the old man picked for her by the traditional matchmaker. Another daughter doesn’t just want to choose her own husband without the matchmaker, she tells him they aren’t even asking for his permission, just his blessing. And as hard as it is for him, Tevye finds ways to navigate and accept these changes to the traditions that had given order to his own life. He finds a new balance, a new normal. But when a third daughter wants to marry outside the faith, that’s a bridge too far. Tevye disowns her and treats her as dead. In their final meeting, all he can mutter is “God go with you,” and he won’t even say that to her face; he won’t even look at her. In this gut-wrenching scene, he can’t let go of his beloved tradition even when it keeps him from having a relationship with his child. In today’s gospel text, Jesus faces challenge from the religious leadership – basically, the first-century equivalent of all us official, ordained leaders in the church – because he and his disciples weren’t following some of the long-standing traditions of the faith – in particular, they weren’t observing the ritual hand washing, which was more than just washing for cleanliness. But Jesus called them hypocrites, valuing human tradition valuing form and appearance, over actual substance. As Jesus looked around him, he saw disciples who had given up home, family, career, some even social status, in order to follow him; and here they were now, being shunned just for not washing their hands in a certain way. In his criticism of them, Jesus wasn’t saying there was anything inherently wrong with human tradition, rules, or rituals. But there’s a problem when adhering to the tradition becomes more important than the underlying issue of God’s will, and God’s mission. In the church, we’re living in a time of upheaval that’s just as unsettling as the times that Tevye was going through. Just as his traditions helped him in many ways, our traditions can give us a sense of identity and community and comfort. And that’s all very important, and very good – unless we end up making the same mistake that Tevye did, and we allow our grip on tradition to keep us from being in loving relationship with other children of God. Because what does it say if we – you, me, all of us – think it’s more important to hold onto our traditions as they are, rather than adjusting them in order to be more welcoming to others? What does it say if we won’t welcome others into the fold just because they want to wash their hands in a different way? There were two small, struggling downtown congregations in a city. Covenant Church was a beautiful old building with a rich history. But the surrounding neighborhood had changed, racially, socially, economically. The remaining handful of members, all well past retirement, had moved miles away into the suburbs decades ago and only came into this part of the city on Sunday mornings. They had talked about ways they could change to reach out to the very different people in the neighborhood around the church, but ultimately they decided it would be too much work for them, and that in any case it would be too much of a culture shock for them. It would have meant changing their familiar patterns of worship and church life too much. Oh, the doors would always be open for any of the neighbors to come in, but there was really only so much they could change in order to be appealing to those people. Really, in the end, Covenant will always be Covenant. Except that now it isn’t. Membership continued to decline in accordance with the immutable truth of actuarial tables. Finally, the congregation folded and the building was sold. Now, the city’s Arts Council owns it, and they host organ recitals and other concerts there, which is nice – but it’s a failure in terms of advancing God’s mission of outreach and serving and loving the people who live in the shadow of the bell tower. Less than half a mile away sits Old Trinity Church. Another beautiful, even if badly run down, building with a storied past. They faced the same challenges as Covenant, but they realized the reality of the situation they were in, and they decided to rethink their traditions and ways of being the church. It was hard, but they decided to change their worship to be more appealing to their African-American and Latino neighbors. They set up community gardening plots on their vacant lot, for struggling families to grow some of their own food. They started a neighborhood food pantry, and they supplemented the usual staples with surplus fresh fruit and vegetables from the garden plots. Today, Old Trinity is still small. It’s still struggling. But it’s still there – and it’s growing, because it was willing to adjust its traditions to meet the new realities of the community that God placed them in. When we think about tradition in the church and how it should work, I think we need to always keep in mind that God is found precisely at the place where church tradition, and church mission, intersect, and where both are mutually advanced. God blesses traditions that create spiritual nurture, a sense of community, and emotional comfort, while not obstructing the mission of reaching out and welcoming others into the church, into the Kingdom of God. “Mmm, meat loaf and mashed potatoes… but what’s this? This meat loaf was made in a round casserole dish; my mother always made ours in a loaf pan. Who ever heard of a round meat loaf? It’s ridiculous! …On the other hand… it wasn’t made with oatmeal filler, like my mother’s always was. I never liked that; I always hated finding oatmeal hiding in my meat loaf. This has bread filler, it’s smoother; I like that much better.